It is the most wonderful time of the year. tailgating, wings, beer, and weekends packed with college and professional teams battling it out on 100 yards of turf. That’s right; it is football season! The weather has cooled off, the tourist traffic has subsided, and you are ready to grab a cold one and watch the game with your favorite fans. Where do you go? What is your favorite sports bar? For most people, location is a big factor, but football fans also want good food, friendly service and a comfortable atmosphere. Street Meet, One Hot Mama’s, Reilley’s Grill and Bar, and R Bar and Grill hold these qualities and are some of the area’s favorite sports bars. Football fans visit Street Meet for the delicious award-winning food and to be with fellow Browns fans. Street Meet is an American tavern on Mathews Drive that holds the official Hilton Head chapter of the Cleveland Browns Backers Fan Club. It is an Ohio bar that shows all of the state’s games, from Ohio State to the Cleveland Indians to, of course, the Cleveland Browns. In fact, on Sundays when the Browns are playing, Street Meet exclusively shows Cleveland’s game on all of its televisions. During other times, various games are showing among the TVs. On Saturdays they show all college games, especially Ohio State. On Sundays this American tavern simulates an enormous tailgate by having a catering set-up in the parking lot, complete with corn hole and drink specials. Super Bowl Sunday is always a massive event at Street Meet, and they rise to the occasion by roasting a whole pig for the ultimate tailgate experience. Street Meet draws a large crowd during football season since Hilton Head is home to so many people from Ohio, but fans also go to this sports bar for the food. In fact, Street Meet has won several awards for its cuisine, including best fish and chips, best hot dog, best wings at Wingfest, and best sauce at the Italian Food Festival. This quaint tavern, which has been open for nine years, also serves food late night, is family-friendly and has both indoor and outdoor seating. Visit streetmeethhi.com for more information. One Hot Mama’s American Grill is located in what is often dubbed as “the barmuda triangle” of Hilton Head Island. It is the area of bars and restaurants right outside of Sea Pines in Hilton Head Plaza. Executive chef and owner, “Mama” Orchid Paulmeier, who starred on the Food Network’s Next Food Network Star a few years ago, has created a fun place for people to watch football games while enjoying “comfort food with a kick.” Every Saturday and Sunday during football season, the staff wears college and NFL team T-shirts, which makes it fun for the fans to banter back and forth with their servers. One Hot Mama’s award winning wings and ribs have diners coming back for more. In fact, this restaurant has won best wings at Wingfest for several years and also earned five out of six first place awards in the rib burn-off this year. Each football season, the restaurant offers a special football menu and runs different food and drink specials throughout each game day. Sundays often draws in regulars who habitually sit in the same seat to watch the game as they have for years. This family-friendly restaurant is part of the SERG Restaurant Group and has indoor and outdoor seating complete with an outdoor bar and fireplace. One Hot Mama’s also offers “tailgate to-go,” making it easy for those patrons hosting a viewing party at home. Visit onehotmamas.com for more information. Offering two Hilton Head locations, one in Hilton Head Plaza and one in Port Royal Plaza, Reilley’s Grill and Bar, which has been open since 1982, is somewhat of an institution on Hilton Head Island. Its friendly staff and longevity on the island bring the locals in throughout the year. During football season Reilley’s is the bar of the New England Partiots. They offer happy hour from 4-7 p.m. and drink specials every day that a football game is being aired. The numerous televisions and large outdoor patio bring in football fans of all ages. In fact, this Boston pub has sixteen televisions, and the South End location has an outdoor bar complete with ten televisions, which attracts a large crowd as the weather cools off. Reilley’s has been voted best happy hour on the island and has live music Thursday through Sunday during the high season. Visit reilleyshiltonhead.com for more information. Do not fear Bluffton football fans, there are great places on the Bluffton side of the bridge as well. 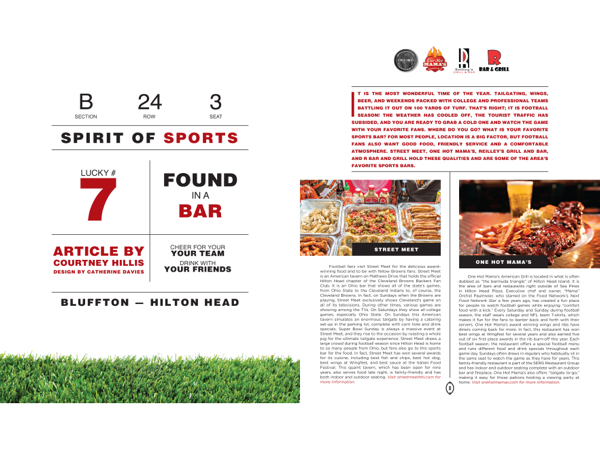 R Bar and Grill, located in Sheridan Park off 278, is a favorite locally-owned spot where sports fans like to visit for the customer service and awesome bartenders. R Bar is “your bar,” and this is demonstrated when regulars arrive and their drinks are waiting for them before they even sit down. R Bar runs specials every Saturday and Sunday, including $2 Budweiser Family bottles and $3 well drinks on Sundays. Sixteen flat screen televisions and two projectors guarantee that fans will not miss an exciting play. R Bar also has video games and corn hole to keep customers entertained during halftime. Garage doors open to a large screened-in patio complete with a huge fireplace. 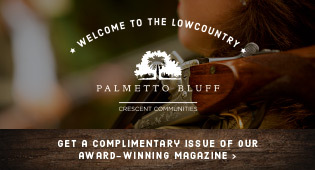 Visit rbarbluffton.com for more information.